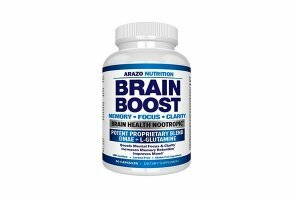 Brain Boost by Arazo Nutrition Reviews - Is it a Scam or Legit? Using a blend of more than three dozen ingredients, Brain Boost by Azaro Nutrition claims to deliver improved memory, concentration, energy, and overall mood. Brain Boost by Arazo Nutrition is a daily dietary supplement that promises to help increase circulation and oxygen delivery to the brain and neurons, resulting in a re-energized mind, the ability to focus on important tasks and work through them faster than ever, and ultimately achieve more self-confidence. Additional advertised benefits for this 41-ingredient blend include boosted memory and clarity, improved mood, reduced stress and anxiety, increased energy, and the ability to achieve peak mental performance, without crashes or jitters. And all of this without the use of GMOs, binder, fillers, or preservatives. According to the website, you only need to take two capsules of Brain Boost once per day, ideally 20-30 minutes before a meal, with an 8 oz glass of water. Whether you’re a college student, working mom, busy professional, or aging senior over 50, will this scientifically formulated supplement deliver on Arazo Nutrition’s claims? Before handing over your money, take a few minutes to read what we learned during our research about Brain Boost. What Is a Brain Health Nootropic? But, do they work? In general, according to organizations like WebMD and ABC News, there’s insufficient clinical evidence indicating this dietary supplement class can help enhance memory or deliver on most of these manufacturers’ claims. Granted, we’re taking a high-level overview at this point. If we zoom in and take a look at Brain Boost’s specific 41-ingredient formulation, specifically, is the supporting clinical evidence more robust? Before diving in, it’s important to emphasize that the HighYa team isn’t comprised of individuals with significant medical or clinical backgrounds. As a result, when determining whether or not an ingredient is effective for a given claim, we rely on the clinical evidence summarizations provided by sites like WebMD, Examine.com, and the Natural Medicines Database. According to these sites, there’s insufficient clinical evidence that most of these ingredients will deliver on Arazo Nutrition’s claims for Brain Boost—at least for otherwise healthy (i.e., non-deficient) individuals. Taking 300 mg of bacopa extract per day for 12 weeks may help improve memory, while 12-18 grams of inositol daily may help control attacks related to panic disorder. 100-300 mg per day of tyrosine could help improve memory and mental performance under stressful conditions, as well as boost alertness following a lack of sleep. GABA (no dosage listed) may help reduce blood pressure, 100 mg of phosphatidylserine (derived from cow brains, not soy or cabbage as with most supplements) per day for three months might address some aspects of age-related mental decline and Alzheimer’s disease, and 60-400 mcg of huperzine A per day may improve some aspects of dementia and memory. Finally, green tea contains mild natural caffeine levels, which could temporarily boost alertness and prevent tiredness. With these potential benefits in mind, it’s important to point out that all of these ingredients are part of Brain Boost’s proprietary blend, so we can’t be certain they’re found in the same dosages as supporting studies. Could Brain Boost’s Ingredients Cause Side Effects? According to the Brain Boost website, this supplement shouldn’t be used by those under 18, who have a known medical condition or allergy to any of the ingredients it contains, or who are pregnant or breastfeeding. WebMD, Examine.com, and the Natural Medicines Database cumulatively add that the most common side effect related to these ingredients is mild, temporary digestive upset, if anything at all (no dosages or other specifics provided). However, bacopa can sometimes also cause dry mouth and fatigue, inositol can lead to headache and dizziness, and some people taking tyrosine may experience heartburn. In some clinical studies, huperzine A has been shown to potentially cause “blurred vision, slurred speech, restlessness, loss of appetite, contraction and twitching of muscle fibers, cramping, increased saliva and urine, inability to control urination, high blood pressure, and slowed heart rate.” Again, no specifics or dosages were provided for any of these. Finally, these same sites emphasize that as little as five grams of licorice is possibly unsafe when taken long-term, as it might increase blood pressure, decrease potassium levels, and even lead to weakness, paralysis, and brain damage in otherwise healthy individuals. How Much Does Brain Boost Cost & Where Can You Buy? If purchased directly from Azaro Nutrition, one bottle (60 capsules) of Brain Boost is priced at $19.95, plus free S&H (USPS Priority is available at an additional charge). We also found Brain Boost sold at on Amazon for the same per-bottle price. However, if you agree to regular shipments, you can save $1 each. All direct orders come with a 60-day money back guarantee, less S&H, while third-party purchases could deliver. To request a refund, customer support can be reached at support@arazonutrition.com or via the contact form on their website. What Can We Learn From Online Customer Reviews for Brain Boost? Brain Boost had more than 1,100 customer reviews on Amazon at the time of our research, who had given the supplement an average rating of about 4.3 stars. There, most compliments appeared to reference effective results (improved memory, boosted focus, decreased fatigue, etc. ), competitive price, and solid support. On the other hand, the relatively few complaints frequently revolved around no results, as well as mild side effects like nausea and headache. As a company, Arazo Nutrition (formerly BioScience Nutrition) is based out of Wilmington, DE and has been in business since 2008. In addition to Brain Boost, they manufacture a wide range of additional dietary supplements, including popular formulas like Boost Maxx, Prostate Support, Testo Boost, and Vital One, to name just a few. Neither company was listed with the Better Business Bureau at the time of our research. Are There Other Nootropic Supplements Competing With Brain Boost? The brain health supplements market represents a multi-billion dollar industry, so there are thousands of formulas competing for the same customers as Brain Boost. Some, like the supplement in question, contain dozens of ingredients, while others might only contain one or two. In fact, the HighYa team has written about dozens of these supplements over the years, including popular options like OptiMind (12 ingredients), Geniux (unknown ingredients list), Brain Storm Elite (3 ingredients), and Neuroflexyn (14 ingredients). With so many options and formulations at your disposal, how can you make sure you’re not throwing your money out the window when making a purchase? Returning to our Do Memory Supplements Work article, the first person you should talk with if you’re thinking about putting these substances in your body is your doctor. They can ask the right questions and order the appropriate tests (if necessary) to accurately diagnose you and implement science-backed treatments. Does all of this bode well for Brain Boost? The bottom line is that sites like WebMD, the Natural Medicines Database, and Examine.com report there’s little clinical evidence supporting the effectiveness of brain supplements in general, and for most of Brain Boost’s ingredients, specifically. On the other hand, the supplement seems to tick a lot of other necessary boxes, including coming from a company with years in business, who has highly positive online customer feedback, and who stands behind it with a 60-day satisfaction guarantee. Just be sure to speak with your doctor in advance and keep in mind that you’ll have to pay return S&H charges if you’re dissatisfied. I have been satisfied with the product. At first, I thought oh well, I hadn't noticed any change, but after reading what they promised, I did notice a change in my mood, my stress. I am more calmer, but last week I started with this twitching nerve, fluttering on my left arm. I started to worry thinking that I might be at risk for a heart attack so after reading this article I hope that it is just this supplement that is causing it. Write a Review for Brain Boost by Arazo Nutrition!